Dell on Tuesday introduced the budget Vostro V13 laptop, which bears a resemblance to the company's super-thin Adamo luxury laptop, but is close to three times cheaper. The V13 laptop, which is priced starting at US$449, measures 0.65 inches (16.5 mm) at its thinnest point, as does the Adamo model that is currently available. The new laptop weighs about 3.5 pounds (1.6 kilograms), half a pound less than the Adamo. The Adamo is priced starting at $1,499, and has a 13.4-inch screen, while the V13 has a 13.3-inch screen. The Adamo uses a faster Core 2 Duo processor and includes some advanced features and a designer finish. However, the V13 can be upgraded to use a Core 2 Duo processor that is only slightly slower in a configuration priced at $649. 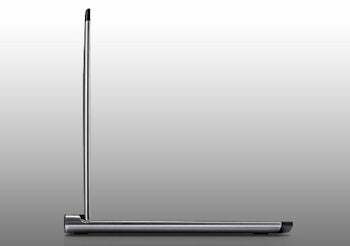 Dell started shipping Adamo earlier this year to much fanfare in response to Apple's MacBook Air, and called the laptop the thinnest in the world at the time. The company has already demonstrated a thinner version measuring 0.4 inches at its thinnest point, which will start shipping by the end of this year, the company has said. The V13 laptop is targeted at small and medium businesses and comes with advanced support options. The $449 configuration comes with the Ubuntu Linux OS and an Intel Celeron processor, while the $649 configuration includes the Windows 7 OS. The laptop supports up to 320GB of hard drive storage and 4GB of memory. It comes with integrated Intel graphics, an integrated webcam and a number of connectivity options including Wi-Fi, 3G mobile broadband and Bluetooth. It does not include an optical drive, which can be bought separately and attached externally. A six-cell lithium-ion battery gives the laptop a five-hour run time on a single charge. The laptop can be ordered on the company's Web site, and it is available globally.